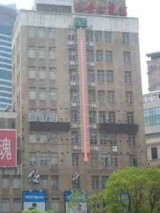 It’s 3pm and 100 degrees in Shanghai. I haven’t felt the heat, though, because I’ve been in my hotel room all day. I got the sniffles last night in People’s Park, and by 10pm my head was aching. Oh, what a rough night. I’ve slept all day except for eating and drinking. My sweetie says colds in China only last three days. Let’s hope he’s right. It’s going to be a hot one here in Wuhan. I’m back at Figaro’s because Starbucks was just too far to walk this morning. Also, I’ve got to be back on campus at noon–one of our Chinese hosts is going to bring me to buy new glasses at lunch time. Mine are several years old, and the price for an exam and new pair of glasses here is about $50.00. I’m in. Ah, at last a real coffee shop. I don’t drink coffee, but I do love what a coffee shop gives me–wifi, upbeat background music, a little table, and the buzz of intellectual activity. Thank you, thank you China and Starbucks. I think I actually sighed when the barista asked if I wanted English Breakfast or Earl Grey. I would be embarrassed if I weren’t so happy.